Wear the correct type of motorcycle clothing from gloves through to boots and event the correct garments its essential, but many people are often under estimate about these. Helmet is very essential for motorcyclist and everybody knows that, but many motorcyclists do not dress in sufficient clothing on their body. Leathers come in a wide range of styles to suit the bikes, riders and different needs and situations. Form of Leather is very tough to give a maximum protection used for motorcycle gear. Cut and burst resistance, impact abrasion and the seams to the zips to check for tearing are all aspect of the suit for tested. Armour for extra protection is inserted into the shoulder area, back, hips, knees and elbows. This time kangaroo skin is used many motorcyclist, especially for race suits, because gives good protection and maximum comfort. Why kangaroo skin is popular when in a racing position, because kangaroo skin moulds to body ergonomically with great movement. Manufacturing techniques, product development and materials make motorcycling clothing has really gone forward during the past the few years with advances. 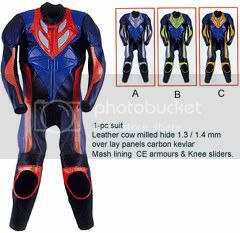 Kevlar and Nylon also materials for motorcycling clothing can be your choice besides leather. Because this materials also far better protection against the weather and much lighter than leather and making them more comfortable while riding. Anti abrasion properties like Kevlar and Nylon After 1690 cycles abrasion test was scratch. And after 52 cycles abrasion test for a couple of jeans was failed. This is evident that ballistic Kevlar and Nylon have fantastic anti scratch properties for protective clothing. You can also allow vents in the design of the garment to let air in when it is hot, the other side ballistic nylon (e.g. Cordura) and Kevlar material keep warmth in when needed. When touring, clothing made from textile garments are good idea because these garments dry out much faster than leathers. Both leather and textile ranges are used for many of the top motorcycling clothing brands.